Most board members are aware of their obligation to ensure their nonprofit’s compliance with certain standard regulations e.g. making tax payments, submitting IRS Form 990s and/or avoiding potential fraud. But what I have found missing in the nonprofit environment is a sense of director responsibility to provide for and sustain a viable ethics program. •	The Audit Committee is Responsible-Business organizations often have a full-time corporate counsel or Compliance Officer who are charged with seeking evidence of unethical behavior. On the other hand, nonprofits must vest their ethics responsibilities in the audit committee. At a minimum, the audit committee should require installing a hotline system that can surface questionable behaviors and issues, a base approach for the 21st century. •	Ethical Behaviors Start with the Board – A review of existing ethical standards should be included in the orientation process of every new board member or employee– and reinforced briefly each year. Potential conflict of interest in board members can skew decision-making and jeopardize outcomes. Engaging in “sleight of hand” decisions can reverberate throughout the organization. For example: it is not unusual for nonprofit boards to seek grant dollars that support programs that are not directly related to the organization’s mission. Similar relaxation of standards can propel an organization down the slippery slopes of ethical boundaries. This also applies to senior managers whose behavior or actions are perceived to be inappropriate. •	Seeking Information – Although the Sarbanes-Oxley acts suggest that board directors are obliged to seek information from persons below top management, this can sometimes become controversial in the nonprofit environment. Especially in community type organizations, some dissatisfied employees may tend to circumvent management as they make “end runs” to share grievances with a board member. In my opinion, if there are issues or opportunities that arise from these board contacts and require action, board members need to review this information appropriately with management. 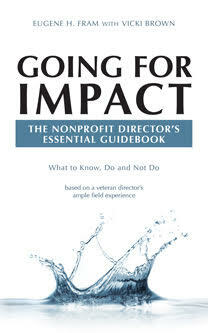 ← What Defines the Culture of Your Nonprofit Board?